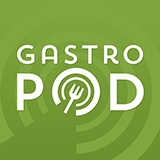 Dogs still occupy a variety of roles in the human food system, from sheep herding to barbecued delicacy. What is less well known is that before the advent of gas or electric ovens, dogs also provided a convenient power source for kitchen appliances. 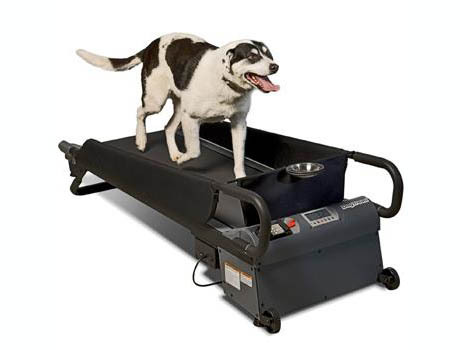 IMAGE: A doggy treadmill, yours for only $639, via Rachel Laudan. Inspired by a contemporary advertisement for a doggy treadmill, food historian Rachel Laudan has posted some fantastic historical images of dog-powered butter churns (offered in the Sears catalogue as recently as the early twentieth-century), as well as the special, now extinct, breed of dog employed to turn meat in front of the fire in kitchens from Tudor to Victorian times. IMAGE: “If you keep a dog, make him ‘work his passage. 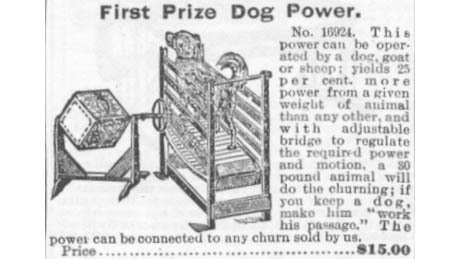 '” A dog-powered butter churn advertised in a Sears catalogue from the early twentieth-century, via Rachel Laudan. The food cooks at a significant distance from the embers, rotating all the while. The rotation means that the heat cannot accumulate too much on any single spot: no scorching. […] Both the flavours and textures were out-of-this-world superb. 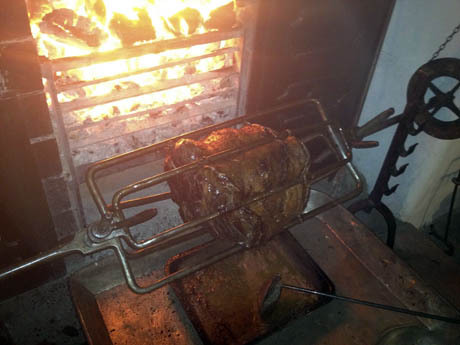 IMAGE: Sirloin of beef roasting in front of a contemporary hearth, via Food History Jottings. Originally, Wilson writes, the job of turnspit was usually assigned to a luckless boy, occasionally as young as five years old, who frequently worked naked or semi-clothed due to the heat. She gives the example of John Macdonald, a Scottish orphan who was demoted from his first job rocking a baby’s cradle to become a turnspit in a gentleman’s home, before rising up through the ranks to become a footman. However, “over the course of the sixteenth and seventeenth centuries in Britain,” Wilson notes that boys had gradually been replaced by animals — primarily dogs, although apparently some cooks preferred to use geese, crediting them with greater stamina and less (troublesome) intelligence. 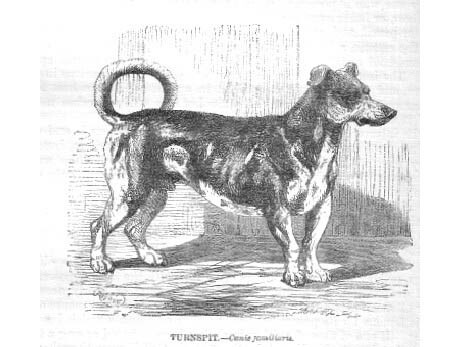 IMAGE: The Turnspit dog, from Reverend J. G. Wood’s Illustrated Natural History, published in 1853, via Wikipedia. The existence of a special dog bred for kitchen service was mentioned as early as 1576, in an English book on dogs. 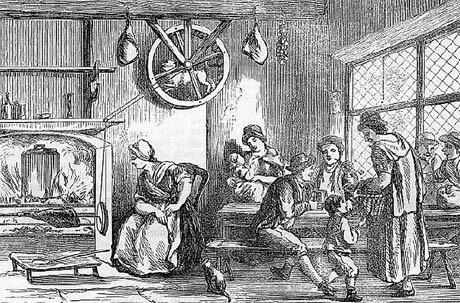 According to the BBC, the turnspit was recognised by taxonomist Carolus Linnaeus as a separate breed in 1756. Based on contemporary references, it was a terrier of some sort, developed from badger-hunting dogs. Turnspits were long in the body, like a sausage dog, with droopy ears and short, strong legs that Darwin remarked upon as an example of a desirable genetic trait nurtured through selective breeding. IMAGE: A turnspit dog at work, in an illustration from c. 1800, via Wikipedia. 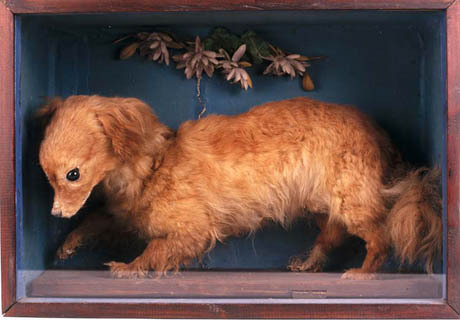 Abergavenny Museum claims to have “the last surviving specimen of a turnspit dog, albeit stuffed,” in its collection. 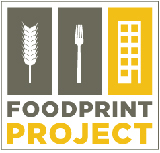 However, Wilson reports that “dog wheels were still being used in American restaurant kitchens well into the nineteenth century,” when, in the face of early animal rights lobbying, they were often replaced with young black children. 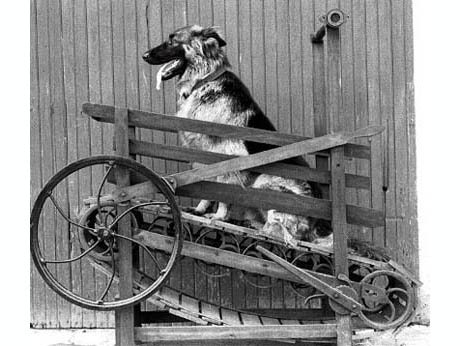 IMAGE: Whiskey, the last turnspit dog, is item A.193.0 in the Abergavenny Museum collection. 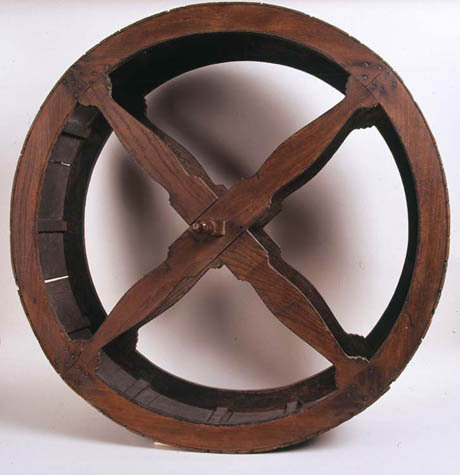 IMAGE: Abergavenny Museum’s collection also includes this example of an eighteenth-century turnspit dog wheel, from Coed Cernyw, Monmouthshire. IMAGE: Another fantastic illustration from Rachel Laudan’s post: Nicholas Potter’s “Enterprise Dog Power” Treadmill (1881) for powering butter churns. Funny coincidence: I looked up turnspit dogs just a few days ago because they’re mentioned, in passing, in the first chapter of On the Origin of Species. Good gracious! I wouldn’t have believed it either!